The CHNA congratulates one of our members, Christina Cameron who has recently been awarded the Prix du Quebec by the Quebec government. The Prix du Quebec is the province's highest recognition and the Gerard-Morisset award for 2018 has been awarded to Christina in honour of her foundational and exemplary work as well as leadership in the area of heritage. Learn more about her award by following this link to read the announcement En français . We have used online tools to create an english version of the announcement...please excuse any inaccuracies caused by the rough tools. Keith has worked tirelessly to defend and improve our neighbourhood and our community..with a special place in his heart for his beloved Parkdale Avenue. Keith has worked with numerous councillors both pre and post amalgamation and has been a key member of the CHNA Planning and Development committee. Keith will be honoured with a plaque in recognition of his work at our Spring AGM. Barb Fischer has been the lead volunteer for the Fairmont Rink for many years and recently stepped down from this role. At the recent AGM, CHNA announced that Barb had been selected as the inaugural recipient of our community Volunteer Award. Barb will be honoured at our spring meeting and be presented with her award. Please join me in congratulating her on this honour and thanking her for her many hours of volunteering to make our community a better place to live! Many people have been interested/concerned regarding the future of the building operated for many years as St. Matthias at 555 Parkdale Ave. We are pleased to share the news that at the building has been sold to St. Mark and St. Mary of Egypt Coptic Orthodox Church – the group that is currently renting the building. This means that the building will remain as a place of worship going forward! The sale is expected to close in early November. To help raise the funds needed to close the sale, St Mark and St Mary of Egypt is inviting the community of Wellington West and neighboring areas for a fundraising supper on Sunday September 17th starting at 6pm (doors will open at 5:30). The evening will include an assortment of Middle Eastern food and guest speakers. Funds will be dedicated to completing the down payment for the purchase of their beautiful new home. Should you not be able to attend and simply wish to donate directly to support the purchase, you can make a donation via their Facebook page. Tax receipts will be mailed by the end of the year. CHNA will provide a community update and we will hear from our special guests; Marion Fraser, UOHI VP Finance, Admin and Infrastructure, with a Heart Institute construction update, Joanne Read, TOH VP Planning and Support Services who will review the project underway to develop the New Civic Campus and Kate Eggins, TOH Director Communication and Engagement, on the project’s framework for public and stakeholder consultation, as well as a ward update from our Councillor, Jeff Leiper. If you haven’t had a chance before now, you can renew/buy your 2017 CHNA membership at the meeting while you enjoy light snacks and refreshments. Hope to see you there! Where: Hintonburg Community Centre, Wellington Room. City staff will be on hand on May 10 to field any further questions about the remediation work you may have. They will also discuss up-coming timelines and field any questions regarding potential construction impacts. Bus Detour NOT welcome on Bayswater Ave. The Province of Ontario has mandated in the recent Smoke Free Ontario Act that all hospitals in the province must be completely smoke free by Jan. 2018. Certainly a laudable pursuit, however, the reality is that smoking is an addiction and simply banning it isn't a complete solution. 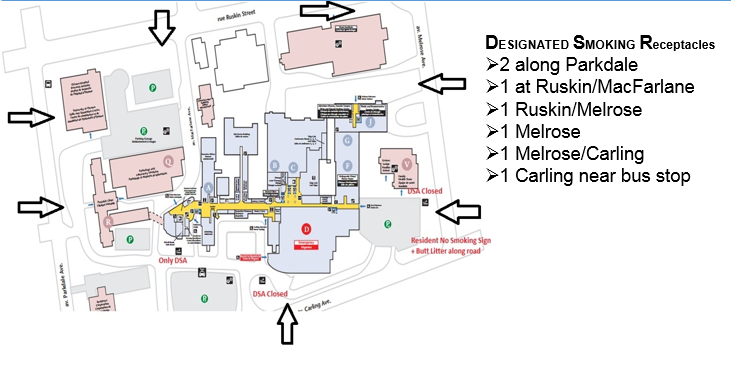 The Ottawa hospital realized that if they simply removed the three smoking areas on the Civic campus to meet the Act, we could all expect to see smokers (staff, patients and visitors) cross the street to our lawns or nearby sidewalks to smoke and litter. The hospital has worked to find a solution so the burden of this Act isn't simply pushed to our community. Some of you have already noticed that smoking receptacles have been installed at various locations on the edges of the campus. These receptacles are there to prevent smokers from walking off the campus to smoke in our neighbourhood as the onsite smoking areas are reduced from the current 3 to 1 (and eventually none). However, we all understand that these receptacles may create their own issues, especially those that are situated near our homes. The hospital is asking us to monitor the receptacles and their use. TOH is willing to move them to better locations, at our request, even if that means removing some of them. However, human nature being what it is, if someone wishes to smoke, and a receptacle is too far away, smokers may simply cross the street (to avoid breaking the smoking on campus rule, which will be enforced) and again, end up smoking on our lawns. With all that in mind, CHNA is asking that residents observe the receptacles and the behaviour of their users, and provide us with your feedback. Based on your feedback, receptacles may be moved and possibly some removed..but we will have to keep an eye to ensure that the removal of a receptacle doesn't cause more issues than having the receptacle in place did. In the coming months, the hospital will be setting out signs to ensure the no smoking policy is being met and that smokers respect the residential area. They will also be policing smokers and offering smoking education information. Please keep in touch with president@chnaottawa.ca, with your observations and recommendations. Crime Prevention Ottawa - 2016 Community Safety Award to Cst. Dawn Neilly!!! On November 7th, Crime Prevention Ottawa announced the 7 winners of their 8th annual Community Safety Awards. The CPO awards recognize the people, groups and programs that have made a difference in preventing crime and making communities safer across the city. CHNA is very pleased to share the great news that our very own Cst. Dawn Neilly, Ottawa Police Service received the Enforcement Professional Award! We are so proud of Constable Neilly, and as always, grateful for her service to our neighbourhood. At our Fall 2016 AGM, CHNA announced that we are inaugurating a community award in 2017 to recognize residents of our community who have contributed to the liveability of our neighbourhood and the well-being of fellow residents. The proposal approved by the CHNA executive can be found below. Stay tuned for further information in the New Year. For the second year in a row, Bayswater will close the streets from Beech to Hickory on Halloween to allow for a fun and safe Halloween street party! Candy can be doled out from your house, or you can setup a table in the street which can be more fun! Streets will be closed from 5:30 to 9:30 and there will be road marshalls helping out. If you need your car during this time, please consider parking on nearby streets...and THANKS! A heads up that the sole bid for demolition work appeared very inflated so the city has decided not to have the demo work done this fall. Instead, the tender for the 2017 construction will include the demolition work. It's expected that the cost will be much reduced using this approach. We don't think this will change the completion date very much..and if it saves money to be used elsewhere, we are all for it!! The top floor of P1 (the main parking garage) at the Civic Campus is under construction for the next few months to fix a number of issues, so parking will be tighter than normal at the campus. 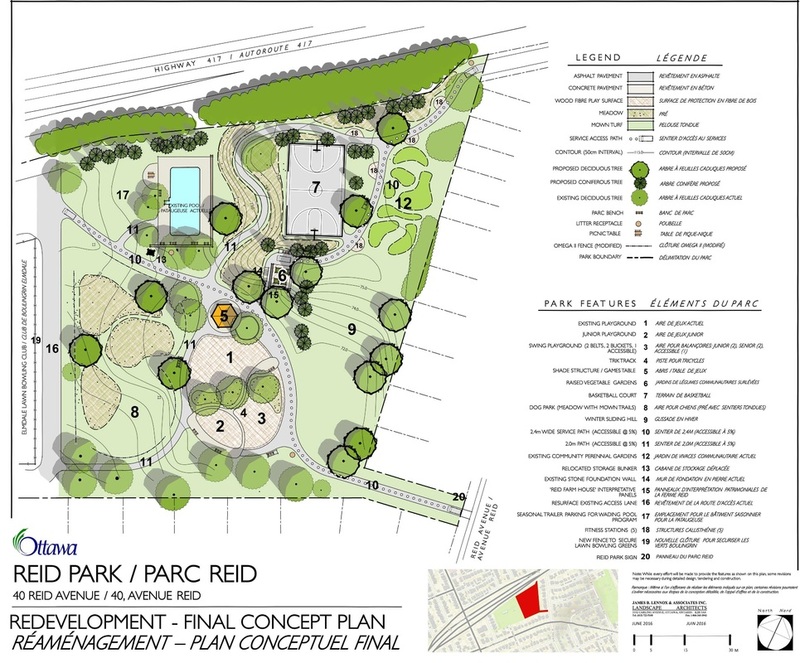 The final design concept plan for Reid Park is IN! Councillor Leiper's office received the following information from city staff: "Based on the input and comments received from the community during public consultations held in late 2015, a final concept plan has been prepared for the redevelopment of Reid Park. Organises the park layout around a pathway network; providing accessible pedestrian connections to all facilities from the four corners of the park. Increases green space and recreation opportunities by removing the existing park building and parking lot off Reid Avenue and by converting the former municipal yard into active recreation space. Consolidates accessible children’s play around the existing school age play structure, while adding new junior play equipment, swings and a “trik trak”. Defines an off-leash dog park with meadow grass and partial fence enclosure. Retains and integrates a portion of the former Reid Farmhouse stone structure into the park landscape, complete with heritage interpretation panels. Re-grades existing slopes in the park to provide an accessible pathway link to the upper plateau area (former municipal yard) and creates a winter sliding hill. Relocates the basketball court to the upper plateau area, along with 5 adult fitness stations. Retains the existing perennial gardens and identifies an area for a future community garden in the former municipal yard. Allows for the future development of a new community building in the park, between the existing wading pool and the shared (park and lawn bowling club) parking lot. Provides new accessible park furniture, including a central shade shelter, park benches, picnic tables and litter receptacles. A detailed design process is now underway to prepare the necessary design documents and specifications for tender in August 2016. Construction is expected to commence in mid-September, with completion anticipated by late fall 2017. While there will be significant disruption to public use of the park through the construction period, the wading pool will continue to operate as scheduled." We are also very pleased at the Civic Hospital Neighbourhood Association's History & Heritage group will both be involved with the heritage feature of the park, as well as have the opportunity to document the farmhouse prior to demolition. If you are interested in that initiative, feel free to reach to us for more information. The OPS is looking to make some major changes to the way the cover our community. We and a number of the nearby communities have a number of concerns which were presented to the Ottawa Police Services board on April 27th. Our joint submission is here. A section of the O-Train Trillium Line multi-use pathway between Young Street and Carling Avenue will be temporarily closed during the weekdays from April 25 until June 10. The multi-use pathway will reopen each weekend, from Friday at 6 p.m. until Monday at 6 a.m. The temporary closure is required to complete the final landscaping and paving work. During the closure, the public is reminded to follow signed detours. Cyclists will be detoured to Carling Avenue to Champagne Avenue to Young Street. Pedestrians will be detoured to Carling Avenue to Preston Street to Young Street. During construction, cyclists and pedestrians will still be able to access the Hickory Street Bridge and Adeline Street. The Ottawa Hospital (TOH) announced public information session on March 7 regarding their plans to move and rebuild the Civic campus. Open House 4:00 pm to 9:00 pm with presentation at 7pm at the Ottawa Conference & Event Centre, 200 Coventry Road. The consultant hired by the hospital to coordinate the session has apologized to CHNA and our residents as, despite their best efforts, they could not find a suitable location close to the hospital for the March 07th meeting. The facility needed to be large enough for the number of expected attendees, offer free parking, and be accessible via transit. Details on our Civic Redevelopment Page. The wish-list created by residents for Reid Park, as part of an exhaustive consultation process, has been submitted to City planners, who have in-turn created professional preliminary concept plans. At the moment, there are two plans (A) and (B), which are quite similar, with the exception of the layout of the asphalt path network. Both concepts detail in a much clearer and professional way the wish-list we created during our consultation process. Unfortunately, a washroom is not feasible with our envelope of cash, however, the park is being designed considering potential future additions. Please have a look at the 2 plans detailed on Councillor Leiper's website here and provide him with your feedback. CHNA cyclists have another reason to cheer on the warm December weather, as the Multi-Use Pathway (MUP) along the east side of the O-Train Line is complete!!! Since August, construction has been taking place on the MUP between Young Street and Carling Avenue, including installing new pathway lighting, adding a raised crossing at Beech Street and providing a new signalized cross-ride at Carling Avenue. With the completion of this work, cyclists and pedestrians now have a new and improved link between pathways along the Ottawa River and south of Carling. Check it out!!! Some good pictures and more info found on a blog HERE. 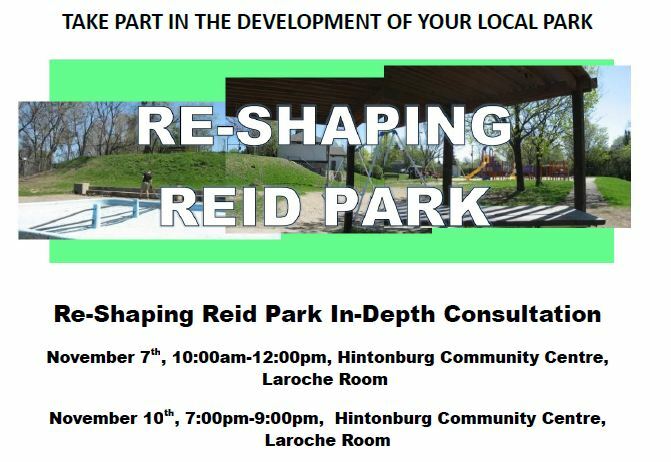 After months of consultation, read what changes to Reid Park the community has recommended to Councillor Leiper. The Councillor's comments can be found HERE. The Ottawa Hospital (TOH) has announced that we can expect public consultations to begin this spring on their plans to move and rebuild the Civic campus. The Champlain Local Health Integration Network (LHIN) recently approved the Hospital's pre-capital submission plan, which opens the door for the hospital to publicly consult on their plans. This will likely be a 2-3 year process as the Hospital consults on the built form of the building, as well as its role in the regional health care system. The CHNA has advocated for public consultations on this matter and we are pleased to see that consultations will finally begin. When consultation dates are announced, we will ensure our members are aware. In light of the recent home break-ins in our area, the CHNA would like to remind residents that by far the best precautionary measure against home burglaries is to keep windows and doors locked and have a Home Safety Inspection done by the Community Police Centre located at 1064 Wellington Street. For details please refer to the Safety Committee post on security inspections. Also, a handy list with contact information for the police can be found HERE. On Thursday November 26th at 0300 hours the resident was on the phone and became aware of a noise at the window. She observed a male looking in. He left when the resident moved towards the door. The suspect is described as a white male, late 30's, short dark hair, clean shaven, skinny face with high cheek bones. Mid morning on Nov. 19, while one of the owners was home, a home in the 700 district of Parkdale Avenue was broken into. The burglar quickly left the home when discovered by the owner, no one was harmed. Police and the K9 unit followed up immediately with a thorough search of the neighbourhood. If you recall seeing anything that may help in the investigation, please call 613-236-1222 ext 7300. Also, do ensure you secure your doors and windows today and as an ongoing practice, even in the daytime. Daytime break-ins while people are often away at work are actually more prevalent than overnight break-ins . After all the meetings (6! ), emails, and phone calls....Councillor Jeff Leiper and the consultant he hired to help with the process, are ready to share with you the results from the community consultations. Come out to hear the results and provide any last guidance you would like to give Jeff. The CHNA supports the efforts of the READ Committee, established in 2014, to promote the much needed expansion and redevelopment of our local library Branch, Rosemount. CHNA has been involved and had a representative on the Committee since the beginning. Over the past year, READ has done a great deal of work. In large part to their efforts, the Ottawa Public Library Board (OPL) has recently commited $1 million to the expansion and redevelopment of Rosemount - earmarked in the recently released draft OPL budget. Work continues to ensure this remains a budget priority. the Hintonburg Community Centre, Wellington Room. For further information on the origin of this process: Visit: http://www.kitchissippiward.ca/content/reid-park-update. Please contact: reidpark@kitchissippiward.ca for any questions or if you are not able to participate in person, to send your suggestions online! “STOP FOR US” Sign Blitz morning of October 9th - As seen on CBC! The city provided the CHNA with Stop for Us signs that have been successfully used in other neighbourhoods at notorious “roll-through” stops. Mornings are extra dangerous with kids walking to school. As October 9th was a PD for many local schools it was deemed the perfect day to have the kids (and adults!) participate in a morning blitz at the 5-corners (Fairmont/Sherwood/Kenilworth), on Bayswater Ave. at Beech and at Holland/Sherwood. Participants came out and shook a “STOP FOR US” sign at the drivers. Based on our success, we may expand to other locations and/or other times. The Ottawa Police Service Break and Enter Unit has noticed an increase in reports of residential break and enters in which the suspect(s) enter the residence by an unlocked front or rear door, including patio doors. More on our "Burglary Alerts" page. Syrian Crisis - Sept. 17 - What a great turnout! Thanks to all who attended. Councillor Leiper is inviting residents to a meeting to discuss how Kitchissippi can help the Syrian Crisis. Come out to learn more. Alpha is a series of video sessions followed by discussions that explore the basics of the Christian faith. St. Mary’s Church (100 Young St.) is hosting a free-will offering introductory dinner and video on Sept. 12 at 6:30pm. explaining what Alpha is about and what the weekly program starting on Mon. Sept. 21 will be like. To register for the introductory dinner, please call: 613- 728-9811, ext.701 by Sept.10. Registration for the Alpha course itself will be available at the dinner or by phoning the above number. A young med student will be taking rotations at the Civic Campus in October-November as well as in March-April-May and is looking for parking. If you have a spot, let us know. You are invited to a public session by the Ministry of Transportation on Aug. 11 to learn about the detailed design for the widening of the 417 and the rehabilitation of the bridges from west of Maitland Avenue to East of Island Park Drive. 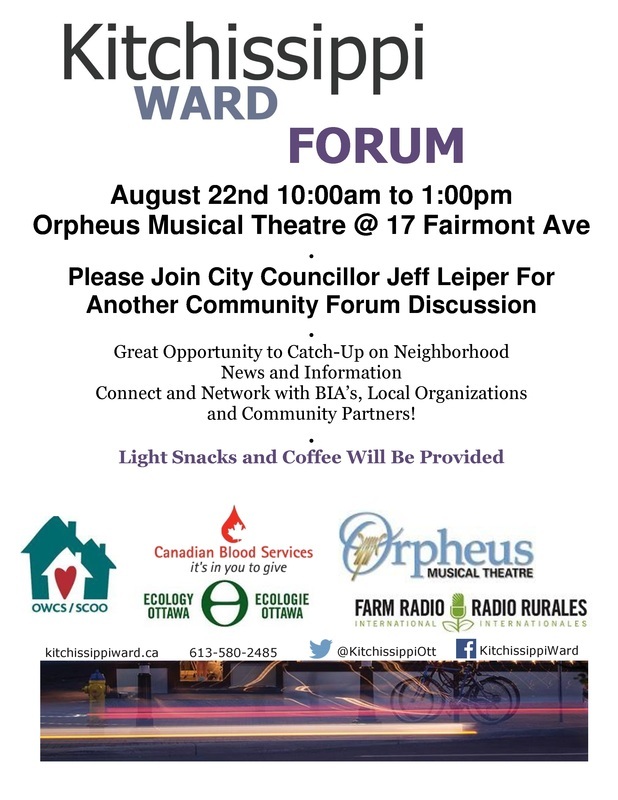 Jeff Leiper, our Councillor, is holding another Ward Forum on August 22, from 10am-1pm at the Orpheus Musical Theatre. You are all invited to attend and join Jeff in a conversation about our ward. Alain Miguelez, Urban Planner and Author has written a book called "Transforming Ottawa: Canada’s capital in the eyes of Jacques Gréber" chronicling, with hundreds of pictures, the many changes that have occurred to the City of Ottawa thanks to the plan set forth by french planner, Jacques Gréber, in the 30's, 40's and 50's. The book is due out in December and as part of a fundraising effort towards the upcoming publishing costs, Heritage Ottawa is hosting a talk with the author on Wednesday, July 8 from 5:30 to 7:30 PM. at Laurier Social House. Called "An evening with Transforming Ottawa" the talk includes a slide show featuring many of the photos from the book. For tickets or information visit www.eventbrite.com/e/an-evening-with-transforming-ottawa-tickets-17421245414. Alain's Facebook page can be found at www.facebook.com/transformingottawabook/timeline. The Indiegogo address is www.indiegogo.com/projects/transforming-ottawa#/story. The Ruskin Parking lot is in need of repairs and will be resurfaced this summer. The work will be done in 2 phases and is scheduled to be completed by late August/early September. Phase 1, beginning June 29th, will see work done on the eastern side (the majority of the lot) with the western portion remaining open. Once Phase 2 begins, the entire lot will be closed until completion. The work will include removing the existing asphalt, placing new granular materials down and then repaving. As part of the project they are also redoing the lighting, provide handicap access to Ruskin from the lot and installing a new parking booth. As well, work is underway to complete the new lot on Ruskin, accessible from P1 (where the old Clinical Studies building was before). Landscaping work will continue even after the lot is open for business. At our Spring General Meeting, Jeff Leiper announced that the Stage 1 project to rehabilitate Reid Park was on HOLD. Stage 1 of the project was to see the building of a fieldhouse this year, to run programs and house community meetings. Stage 2 of the project was not yet funded, but it would cover the "green side" and provide major landscaping of the park. As the funds currently available are insufficient for the size of fieldhouse needed by the community, Councillor Leiper has put the project on hold to ask you, the residents, how you want the parkland development funds spent at Reid. Read Jeff's article on this project and provide him with YOUR input on what you want to see done at Reid and how best to spend these parkland development funds. Bayswater Avenue will be closed between Beech Street and Sherwood Drive on June 20th from 3-6 pm for the First Annual Liveable Bayswater Street Party. Information about the Party can be found here. CHNA residents are invited to come to the party and join in the fun. Fairmont Avenue will be closed between Carling Avenue and Sherwood Drive on July 1st from 12 to 10 p.m. The celebration will begin at 3 pm….we hope to see many CHNA neighbours! The Heart Institute held a second Public Information session, similar to the one held in January, and provided residents with updates on the expansion construction project. More details and the presentation can be found HERE on our Heart Institute development page. Reconstruction of the project has been delayed until 2016. Updates will be available in early 2016 with a new start date. Construction starts mid May with BOTH ramps affected. Westbound traffic Exit nightly closures begin July 6. Eastbound traffic exit has nightly closures beginning June 18. Click HERE and HERE and HERE for details. This is gonna big BIG. A fox family is living and hunting at night in our neighbourhood. Keep small pets safely inside. A resident has setup the following online form to document sightings and interactions. Taiga Non-Profit Housing Corporation is looking for members to sit on its board. Taiga is a 104 unit affordable housing building located at 2100 Scott Street (corner of Churchill and Scott). If you are interested in becoming a member of the board, please indicate your interest by June 8 to taiga@on.aibn.com or call 613-725-2651. Library Bd applies for Grant for Rosemount! May 26- At a special meeting, the Ottawa Library board passed a resolution to apply for $1M in Canada 150 funds to refurbish Rosemount Library. Read all about it here. CHNA Spring General Meeting - May 27, Hintonburg Community Centre. - Get up to date on a variety of topics. 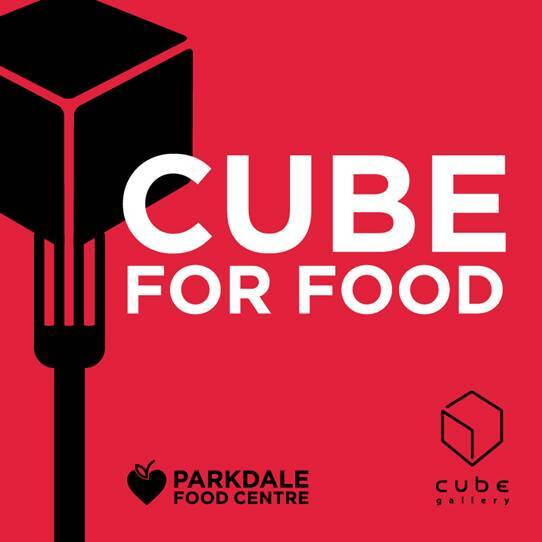 We will have a guest speaker from the Parkdale Food Centre, and our councillor Jeff Leiper will be on hand to give us an update and to take your questions. The "Liveable Bayswater" group is organizing a residents' meeting on Tuesday, May 5th from 7-9 p.m. at The Happy Goat Cafe - 35 Laurel Street between Breezehill and Loretta. At the meeting, Bayswater residents will be discussing strategies for diverting traffic and slowing cars down on their street. CHNA residents interested in learning about traffic issues and potential solutions for their streets are also invited to attend. It happens more than we think. A conversation turns abusive, a relative demands money, a senior is neglected; this is Elder Abuse, and it’s a crime! Check out the Sprouting Community Gala a fabulous night of food and drink to support the Parkdale Food Centre. The evening will be filled with amazing food from Absinthe, Dish Catering, Urban Element, Supply and Demand, Holland Cake & Shake and the Merry Dairy. Beyond the Pale will be providing wonderful local beer and there will be local music and a small Silent Auction. - Select this line for details! Westboro Beach - Tree order! The Westboro BeachCommunity Association is offering locally grown Tree Seedlings for $10 per tree with delivery in Early May. Learn more at http://www.westborobeach.ca/home/treeandshrubsale. Help make Ottawa a bit Greener! 6th Annual Parks Cleanup - Fantastic Success! 1st Annual "Ruskin Berm Cleaning"- a HUGE SUCCESS!! Sunday April 26th --2pm to 4pm- Ruskin Park (aka the Reid/Hutchison/MacFarlane berm). One of our fabulous neighbours registered with the City Cleanup program...come on out and help us clean up the berm ...and keep our neighbourhood looking green instead of like a car park! Road construction is planned for mid June 2015 to end of October for Orrin, Reid and MacFarlane. This includes reconstruction of watermains, sewers and roadway including sidewalks. See notice attached for more info. A Safe Streets Working Group has been created in the ward. Kitchissippi Councillor Jeff Leiper has initiated the group with the intention of creating an inventory of areas within the ward that need some TLC to get them working well for pedestrians, cyclists and drivers. 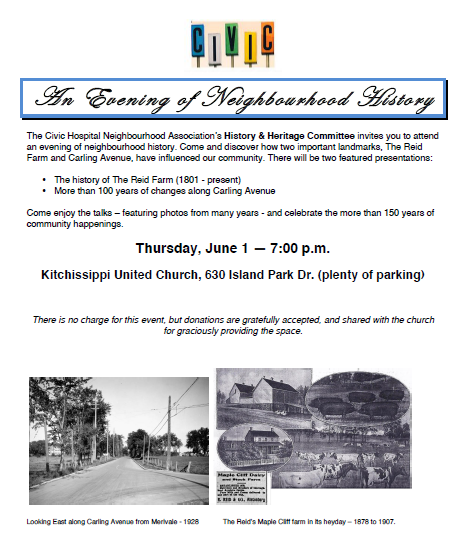 The group is sending out an invitation to all Kitchissippi residents to bring forward the areas of concern in their neighbourhoods. Contact safestreets@kitchissippiward.ca or call 613-580-2485. Five Queensway Bridges of interest to CHNA are scheduled to be re-habilitated by the Ontario Ministry of Transportation (MTO) in the coming years: Holland, Parkdale, Fairmont, Bayswater and CPR/O-Train. MTO is currently undertaking a design and environmental assessment study and is seeking public input on the project. As the future look and feel of these bridges are of great interest to residents of the Civic Hospital neighbourhood, CHNA's Planning Committee has prepared a draft submission on which it is seeking comments from residents. The submission (which must be sent to MTO by Friday March 13, 2015) is attached below. If you have any comments or input which you would like to see incorporated into this submission, please send them to kathyltk [at] gmail.com by end of day, Wednesday, March 11, 2015. Additional information on the bridge rehabilitation project can be found at www.queenswaymidtownbridges.com. The Ontario Ministry of Transportation (MTO) will be rehabilitating four (4) Queensway bridges adjacent to the Civic Hospital neighbourhood - Bayswater, Fairmont, Parkdale and Holland. Both CHNA and Liveable Bayswater will be providing comments. CHNA residents are encouraged to submit their individual comments. We also ask that you share your comments with CHNA HERE so the association can prepare an official response, which is due March 13, 2015. Thursday, February 26, 2015	4:00 p.m. - 8:00 p.m. Interested in ensuring the City budgets for what matters most to you? Protecting our trees perhaps? Investing in the Rosemount Library? More support for those needing help with food and shelter? Help with traffic? The city needs to hear from you! Our Councillor, Jeff Leiper, along the councillors from 2 nearby wards, is hosting an interactive discussion regarding the budgeting process and YOU are invited! It’s happening Tuesday, February 10th, 7pm – 9pm at Tom Brown Arena. More details can be found HERE. St. Matthias has you covered. They are holding a Shrove Tuesday Pancake Supper on February 17th. See attached for details. Elmdale's 2015 Bookfest will be on Feb 27th from 9-9pm and on Feb 28th from 9-4pm. books, Frances Itani, the multiple award-winning author of books for children and adults, whose latest work, Tell, was short-listed for a Giller, will be reading from her work at the Elmdale BookFest. Find more info here. At our November 2014 AGM, Jeff Leiper mentioned a large governance document he has been given with only a week to review before he will be expected to vote on next week. If you have time to help, he asks for extra eyes to review some or all of the document and to pass along any concerns or comments to him. Just send your comments to info@chnaottawa.ca and we will send them along to Jeff (his City email address won't be in place until Dec. 1)! Learn what it is, what are the signs, what to do if you suspect Elder Abuse, and what community resources are available to help. Good ideas and reminders from the OPS. 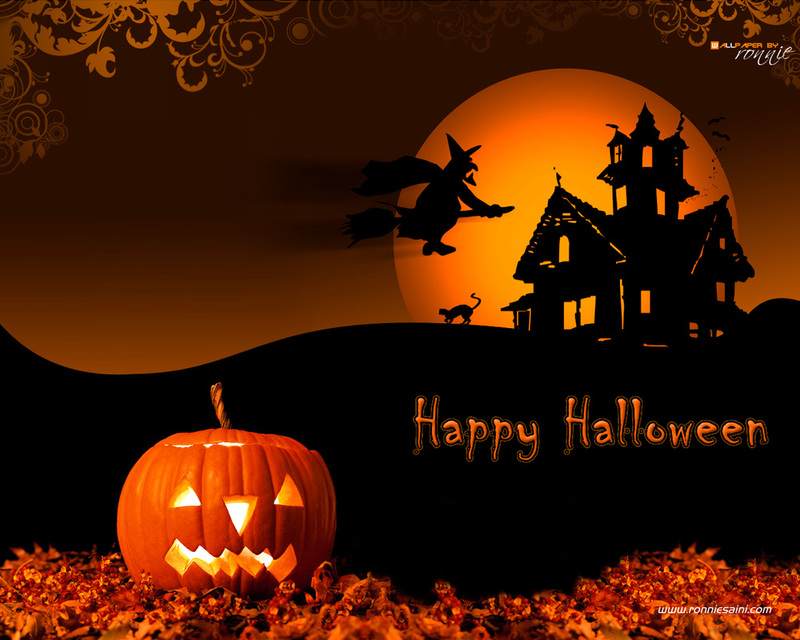 Remember, practice safe "Trick or Treating"! It can be argued that no other level of government has a greater impact on your day to day life than at the municipal level, so CHNA strongly encourages our members to learn about the candidates for our area and VOTE on Oct. 27! CHNA joined forces with the Hintonburg Community Association and on Oct. 1st we co-hosted an All-Candidates Meeting for the upcoming municipal election. If you missed the live debates you still have opportunities to hear the candidates speak. ﻿Oct. 6 - St. Georges Parish﻿ debate is now available on Youtube ! If you missed the All Candidates Meeting, catch this one on Youtube! Pickleball lines have been painted on the Fairmont Park tennis courts and a regular game has started up, weekdays at 10:30am. Fun and easy to learn. Anyone with any type of racket and ball experience tends to pick it up very quickly and it is suitable for non-athletic people looking for a fun way to get a workout, have some fun, and meet new people. If you are interested, contact Randy Kroeker (randy.kroeker@gmail.com) if you would like an introductory game, lessons, or to see if anyone is showing up on a given day. Please welcome to our community our new Community Police Officer, Constable Dawn Neilly-Sylvestre. Constable Neilly has an office at the Hintonburg Community Centre and if you need to contact her, she can be reached at neeilly@ottawapolice.ca. Award winning author, musician and Ottawa Citizen columnist, Phil Jenkins, brought his unique and engaging perspective on the history of Ottawa to CHNA on May 27th. The talk was lively and gave gave us Phil's take on the culture, moods and personalities that have influenced today’s Ottawa. Our thanks to St Matthias’ Anglican Church for donating their beautiful space for this community talk. Learn how to protect yourself and your family from rip-off renovators, shady salespeople, bogus charities, e-mail or phone scams, con artists and fraudsters. The CHNA and the Hintonburg Community Association (HCA), are co-hosting a special 1-Hour Fraud Prevention Seminar on June 10th featuring speakers from the Ottawa Police Services and the Rotary Club of Ottawa. How to recognize the latest scams. How easy it is to be caught by scammers and fraudsters. The steps you can take to protect yourself. What to do if you are a victim of a scam. This seminar is open to the general public. There is no admission charge taken nor pre-registration required. When: Tuesday June 10, 2014 - 7 to 8 p.m. The Ottawa Hospital has decided to postpone their garage development plans for Ruskin Park and have put their rezoning application on hold until at least the FALL. See the full article on the Ruskin Subcommittee page with details on the reasoning they have provided and details on the 2 surface parking lots they plan to put on their property this spring. The March 20th edition of NEWSWEST features an update on the Liveable Bayswater campaign. The article recalls the beginning of the campaign, its early success and continuing challenges. At the request of the hospital, the development application is ON HOLD and WILL NOT be heard on March 25th! We do not have all the details as to why the hospital made this request nor have been informed as to what their current strategy is, but will update you as soon as we do. We do know that the hospital is currently looking at alternative parking options on their own property!!! Way to go TOH!! The Gladstone Station District today is a unique area within the heart of Ottawa brimming with both history and future potential. The City of Ottawa is undertaking the Gladstone Station District Community Design Plan (CDP) to work collaboratively with the community to explore, develop and recommend a vision and design concept to guide private development and public works projects in the area over the next 20 years. The residents and land owners are invited to attend this second Open House located at a storefront right in your community. Drop-in: 10 a.m. to 4 p.m. The Hintonburg Community Association is hosting an information session on February 18 to discuss the LRT Scott/Albert Bus Detour and to get public feedback. This detour is expected to have a widespread effect in our area so please consider attending. The Community Police Centre on Wellington Street advise that over 20 home inspections were completed in the Civic area during the period from March to September, 2013. Growing interest in having these inspections likely arises from the increasing number of burglaries in our neighborhood. Residents wanting to have the inspection done are encouraged to contact the Community Police Centre by telephone (613-236-1222, ext. 5870). Leave a message for the Home Security Coordinator and your call will be returned. The End of Local Door to Door Mail? Canada Post has announced their intentions of ending door to door mail delivery in urban centres in Canada. This has some serious implications for our neighbourhood residents and businesses. For further info, please see the CHNA letter (posted in the Neighbourhood News Section) to the Minister responsible for Canada Post, and if you’re willing, we encourage you send your own opinions to all concerned. Our Mayor, Jim Watson, is already on the record opposing these plans. CHNA reviewed the Demolition Control Proposal being considered for 111 & 115 Parkdale Avenue and 71 Burnside Avenue. The proposed development, which borders Tunney's Pasture, would be a 30-storey condominium building. The text of the CHNA submission can be found by clicking the title. CHNA has been actively involved in City of Ottawa consultations concerning the Preston-Carling Public Realm & Mobility Study, including organizing resident-only meetings and preparing detailed submissions. The final version of this Study is close to completion. CHNA continues to have serious concerns around some of the components of this Study and provided comments on the current draft to City Planners on February 5, 2014. The text of the CHNA submission can be found by clicking the title. On Jan 28, 2014, the Ottawa-Carleton District School Board made a number of decisions with respect to the Near West Accommodation Review. The full details of the Boards decision can be found through clicking the title. As part of a local commercial zoning study, the City of Ottawa is looking for feedback on existing shops and locations, the types of shops and services that might be appropriate for residential neighbourhoods such as ours, and the accessibility of these shops through cycling, walking, transit and driving. CHNA provided feedback on this study on January 29th. The text of the CHNA submission can be found by clicking the title. We have had another car break in on Hutchison Ave were the thieves were looking for personal and vehicle ID rather than valuables. This article from the Ottawa Sun explains how this crime is on the rise. Ensure you lock your car and keep your insurance and registration information in your wallet, not your car. Canada Post has announced their intentions of ending door to door mail delivery in urban centres in Canada. This has some serious implications for our neighbourhood residents and businesses. For further info, please see below CHNA letter to the Minister responsible for Canada Post, and if you’re willing, we encourage you send your own opinions to all concerned. Our Mayor, Jim Watson, is already on the record opposing these plans. Feb 5 Open House- Infrastructure Renewal for Irving Place, Laurentian Place, Carling Ave, Oakvale Ave, and Lynwood Ave.
Wednesday, 5th February 2014, 7:00 to 9:00 p.m.
Our squirrels need your help! We've received word from the Ottawa-Carelton Wildlife Centre that the city has been pruning and or removing damaged trees around town and inadvertently have removed squirrel nests in those trees. During the bitter cold weather, the poor animals can only hope to find a new home by finding entry into your home...and if unsuccessful will suffer needlessly. Please contact our councillor if you are aware of any situations near you as city policy is that the trees be left until spring if a nest is in place. The City of Ottawa is considering a proposal from Tamarack Homes for a Zoning By-law Amendment and an Official Plan Amendment to allow for a 9-storey condominium. CHNA opposes this proposal and the text of the CHNA submission can be found here. Hot News...the meeting has moved again, to early Spring. So, thanks to those of you who were planning to attend..and get ready for a spring meeting tentatively scheduled for March 25. More information can be found on the Ruskin Park Subcommittee page, including a copy of the City Planner's report regarding the development application. The City of Ottawa's Planning and Growth Management is proposing several amendments to the Zoning By-law as it relates to the conversion of residential use buildings. CHNA submitted its comments on the proposal on January 9th. The text of the CHNA submission can be found here. The Carling-Preston Public Realm and Mobility Study has completed the final phase of public focus group and open house meetings. See the summary comments of the CHNA Focus Group Reps here. This winter we're getting our fair share of freezing rain and bad sidewalk conditions. Icey sidewalks can be dangerous and the alternative, walking on the road, equally so. Here's what you can do to get the City to help. Check out the "Our Neighbourhood - Schools" Section for an update from Jennifer McKenzie. Jennifer is our Ottawa-Carleton School Board Trustee and passed along an update for us. One item in particular she'd like people to be aware of is a proposed change to the start time for school. Details are in the document provided along with where you can send your comments if you have any concerns regarding this change. The city meeting to review the zoning application for 45 Ruskin has moved again and will now be heard at the January 28th Planning Committee meeting. We hope you will consider attending that meeting to show your opposition to this proposal and to put some real faces to our neighbourhood concerns. The meeting is set to start at 9:30 am in the Champlain Room at 110 Laurier Avenue West (City Hall). When the full agenda is set, we will let you know when the zoning application is expected to be discussed. Are there too few, too many or just the right number of local shops and services in our neighbourhood? CHNA looking for input on existing and/or potential local shops and services in our neighbourhood. Click title for more information. Year End Report from our Community Advisory Committee is in. Read the year end report on the TOH CAC subcommittee page..and check out a fascinating report on what is needed to reduce Healthcare costs in Canada. Consider attending the next meeting of CHNA’s Planning and Development Committee on January 15, 2014, 7:00 p.m., at 295 Bayswater Avenue. Ottawa Citizen Prints Liveable Bayswater Op-Ed: "Protect Ottawa's residential streets"
Slippery Sidewalks? What you can do about it. By the way, the statistics generated by calls are used to allocoate resources to sidewalk maintenance in the subsequent year’s budget. Friends of the Farm are holding a USED BOOK DROP-OFF for our Used Book Sale to be held in June. No magazines, encyclopaedias, or text books. Putting the Park back in Parkdale! Who knew that front yard gardening would result in a CHNA couple receiving the 2013 Trillium Award? 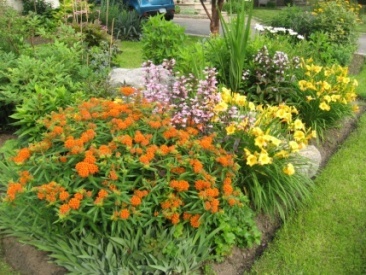 Every year the Ottawa Horticultural Society www.ottawahort.org selects a postal code and, unbeknownst to homeowners, views every front garden from the street once in the spring, summer and fall. And in each of these gardening seasons, they photo document potential garden candidates that exhibit outstanding beautification of the neighbourhood. This year’s postal code was K1Y (Ottawa River to Carling, O-Train to Island Park) and was judged by the Garden Competition Committee of OHS. They evaluated gardens according to criteria based on overall design including bed layout, framing, balance, hard scaping, variety of plant material, colours, condition and maintenance. 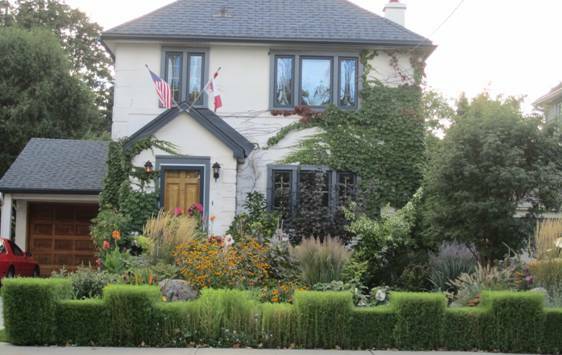 The front yard garden of Bill Collins and Kate Harrigan (center in picture #1 above) at 596 Parkdale Avenue was judged the most outstanding and given the 2013 Trillium Award with the George L. Myles Trophy on Nov 26, 2013. Other outstanding gardens were recognized with honourable mention certificates – Sue Chalmers (left) at 44 Warren Avenue, and Pat Russell (right) and David Ward at 14 Warren Avenue. As one neighbour suggested, it’s like putting the ‘park’ back into Parkdale. We couldn’t agree more, congratulations Bill and Kate! We think it completely fitting given they are long time CHNA members and Kate is very active on the Parks Committee. 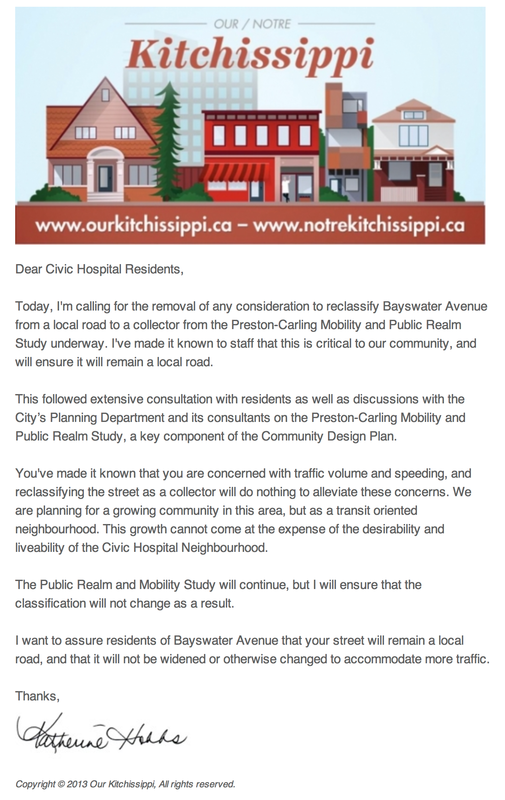 Councillor Katherine Hobbs announced on November 25th that she has asked city staff to remove any consideration of reclassifying Bayswater Avenue to a collector. See below email. Click title for more details. Bayswater residents have organized a sign campaign to demonstrate their opposition to a city proposal to turn their residential street into a collector. At the same time, the Liveable Bayswater Working Group sent a petition to Councillor Hobbs, the Mayor, Councillors Hume and Egli and city urban planner, Randolph Wang. A letter writing campaign is also expected to be finalized this week. The next (and final) Public Realm and Mobility Study Public Session will be held at 18:30 - 20:30h on December 9, 2013 at the Tom Brown Arena, 141 Bayview Road. Bayswater as Collector? Residents say NO! At our Nov. 6 CHNA Annual General Meeting, and at a previous Bayswater residents-only meeting, the issue of Bayswater being designated as a "Collector" was hotly discussed. For a detailed agenda, check out the events calendar. Fun was had for all at our Pumpkins in the Park event held October 19th, despite the intermittent rain showers. Photos of the event have been uploaded to our Photo Archive. If you have any additional photos to share, please send them to webmaster@chnaottawa.ca. CHNA participates in regular meetings with the Ottawa Hospital as part of a Community Advisory Committee. Select the title and you can read the minutes from September's meeting. The Near West Accommodation Review Working Group intends to present three scenarios at the Public Meeting on October 24, 2013 in the Fisher Park auditorium, from 7:00 to 9:00p. Click title for more details. To mark the grand opening of the second Terra20 store—a boutique in Wellington West—they want to support an initiative or cause about which our community cares. From now until Oct. 24, they will be accepting nominations for which community initiative to support with the sales from their grand opening preview event. They will donate 10% of all sales that night to the initiative that’s chosen by their panel of Kitchissippi notables. A Small Victory for Sherwood! 40km/h speed limit for Sherwood on it's way. Click on title for more details! Our premier community event is a treat for young and old alike. Little ghouls & goblins will have a fun-filled afternoon of pumpkin decorating, face painting, games & activities all free of charge! Halloween costumes for the kids are de rigueur; the judges’ favorites win a prize! A giant bouncy castle will also be on site, weather permitting. For the adult crowd, there’s a pie baking contest (see below), a bake and refreshments sale, and a free pumpkin courtesy of realtor and platinum sponsor Susan Chell. Special thanks to our other lead sponsor, Amanda Farris - Mortgage Brokers Ottawa. See you there! You don’t have to be a great baker to enter. All you need are four ingredients: a pie crust, some filling, a taste for fun, and some community spirit. Mix them together and bring the results to Pumpkins in the Park. That said, the winner will be crowned CHNA Best Baker for 2013! Contestants will need to bring 2 pumpkin pies to Fairmont park at 12:45 just prior to the start of the event. For entry registration, please send your name, phone and email address to president@chnaottawa.ca before Oct. 15th. It's as easy as pie! We invite you to attend the Public Information Session to review the team’s work in progress and to provide your feedback on our preliminary suggestions for streets, parks and open spaces. As a result of the meeting of Sept. 4th, the CHNA collated the written and spoken comments of concerned residents into a document to submit to the City’s consultants for the deadline of Sept. 16th. To view a copy of the submission along with supporting info, click the post title. It is expected that another focus group meeting and full open house on the issue will be held in early October. Stay tuned here for further announcements. Kathy Kennedy, Peter Eady and Tony Lovink worked hard to prepare this and feel that it captures residents’ opinions and concerns and suggestions. On September 4th, neighbourhood residents met to review and discuss the Public Realm and Mobility Study where the residents’ focus group reps, ran through the full presentation as developed by the consultant, The Planning Partnership. Full presentation and additional details can be found by clicking the title of this post. On Wednesday, Aug. 28 the CHNA executive and Ruskin Lot sub-committee held a meeting at St. Matthias to review TOH's zoning application submission. For the slide set from this meeting, click the title of this post. The CHNA executive and Ruskin Lot sub- committee reviewed the studies that TOH provided to the City as part of their re-zoning application. To view the questions asked by CHNA and the responses given to us by TOH click the title to the post and scroll down to the matching title of this post. The City has appointed its consultants for the Carling-Preston Public Realm and Mobility Study. One of our obligations is to go into the community and get ideas, comments, complaints, etc. and distill them into the discussion with City Staff and the consultants. There will be a series of public open houses involving the City, consultants, etc. The process will continue through the fall with the results being submitted to the City and then on eventually to the Planning and Development Committee and then City Council for ratification. A new CHNA letter to neighbours has been posted with an update on the latest status regarding the Ottawa Hospitals Plans. Click the title for details. A Facebook site has been established to help share information about the proposed development at 45 Ruskin. If you are a facebook user, please "like" the site and invite your friends to also "like" it. Click the title of this post to access the site. Volunteers are needed for the 3rd Annual Pumpkins in the Park. This fun filled afternoon event in October brings out hundreds of neighbours from our fantastic community, but we do need some help setting up. If you are interested, please click here for details. Ruskin Park Sub Committee Meeting Agenda for July 23, 2013. The newly created Ruskin Park Sub Committee will be meeting on July 23rd to discuss the latest developments. Agenda items can be found below. For more info on the Ruskin Park development, click heading above. Click here for all the current information. All the information on the Ruskin Park issues and proposed hospital parking garage can be found here. The Near West Working group is working towards achieving a set of recommendations that will support the objective of alleviating the capacity issues at Devonshire and Elmdale Public Schools while providing students with local access to programs and balanced enrollments across study area schools. For the latest details from the latest working group meeting, click here. Councillor Katherine Hobbs and other City of Ottawa officials joined representatives of the CHNA on June 13th for a resident-guided, citizen-centred tour of the neighbourhood to be affected by developments around the Preston and Carling District. The one-hour tour, initiated and organized by CHNA, provided an excellent opportunity for residents to meet with key City Officials and discuss the scale of the proposed developments and their impact on the community. Among the issues raised during the tour were: the value of transitional zoning that is sensitive the existing community; the need for traffic management measures to deter excessive traffic from residential streets; and the importance of green spaces as an essential component of urban intensification. Joining Councillor Hobbs from the City of Ottawa were Randolf Wang, Planning and Growth Management; Wook Kang, Area Traffic Management; Danielle McGee, representing Mayor Watson’s Office; and Geoffrey Hall, Assistant to Councillor Hobbs. CHNA representatives on the tour were Peter Eady, Chair, Traffic Committee; Kathryn Williams, Chair, Planning & Development Committee; Katherine Steinhoff; George Laing; and Kathy Kennedy. Both City Officials and CHNA residents appreciated the opportunity to have “on-site” discussions while experiencing the residential streets that will bear the brunt of intensification. At the conclusion of the tour, City Officials were provided with a thought-provoking information package that covered the points of discussion during the tour and summarized CHNA’s positions on the key issues. The package also included a list of CHNA contacts for further information. An ongoing “intensification” dialogue between CHNA and City Officials is expected to continue through the summer and into the fall, when decisions on the strategic direction are expected to be finalized. For the latest updates on events in the neighbourhood, check our our twitter feed embedded on the home page. For the latest upcoming events in the neighbourhood, check out the events calendar. Beware of anyone calling to arrange appointments to sell CPR classes. If you have been contacted by these people, call the Ministry of Consumer Affairs at 1-800-889-9768. They have a file open on this issue and can provide additional advice. If you paid by credit card, you can dispute the charge. Comments are due on Monday Feb. 11th so please take the time to read the proposals and send your comments in to the email addresses provided on the website. There are some significant proposed changes related to zoning and height. The Neighbourhood Watch Committee is looking for more volunteers. CHNA has seen an increase in the number of home and vehicle break-ins over the past year and has decided to move forward with implementing a Neighbourhood Watch Program. We have several residents ready to lead the charge but in order for the program to be successful we need a volunteer representative for every block. Please consider joining this committee so that we can reduce crime in our neighbourhood and improve the safety of our homes and residents. If you are interested in helping with this initiative, please complete the Neighbourhood Watch Sign Up Form or email us at chna4u@gmail.com. Thanks to Peter Eady and our volunteer feet on the street, we have people petitioning to make sure that 50% of our streets are reduced from 50kph to 40kph. Our residential streets are used by bicyclists, pedestrians, pet owners and children and we want to ensure their safety by keeping vehicular traffic at a reasonable speed. Once the weather warms up, we will be asking for more volunteers to canvass the streets that are remaining. Getting a street petition signed doesn’t take much time at all. Most streets can be finished in 2-3 outings and we’ve found that most homeowners are quite happy to support this initiative. It’s also a great way to meet neighbours you might not already know. Click here to see which streets still need petitions signed. If you’re willing to assist with this endeavor, please send Peter your contact information at peady23@sympatico.ca and he’ll follow up with you and show you how easy it is to make a big difference. The Fairmont Park Skating rinks are now open. For more information, check out the this page. Pumpkins in the Park 2012 a Huge Success! Once again, this years Pumpkins in the Park event was a big hit with the neigbourhood children and adults alike. For photos, click here.